A photo by Zoë Ghertner, part of a photoshoot of Atelier E.B’s Jasperwear 18/19 collection. Atelier E.B Jasperwear collection, 2018. Laura wears ‘Mary’ silk thobe shirt and ‘Blair’ silk trousers with ‘Halston’ polo neck in silk cashmere, ‘Disgrace’ wool mix scarf, ‘Colin’ leather belt and ‘Scutum’ umbrella. Beca Lipscombe first laid eyes on Lucy McKenzie at an opening in 2000. The recently graduated designer was on the lookout for someone to model for her eponymous label. McKenzie agreed, but soon their friendship developed beyond that of muse and designer, transforming in 2007 into a collective fashion project they call Atelier E.B, named after the cities where they live (Lipscombe in Edinburgh, McKenzie in Brussels). A portrait of McKenzie and Lipscombe as a film still by Martin Clark. Makeup and hair by Anita Anderson. Whereas Lipscombe and McKenzie still maintain their own practices as an independent designer and an artist represented by Galerie Buchholz and Cabinet, Atelier E.B operates as a space for promoting shared concerns, including the preservation of indigenous crafts and rethinking of traditional display and dispersion strategies. Over the years, the duo’s ideas have manifested themselves in forms ranging from garment design to immersive pop-up boutiques, furniture, zines and sculpture. 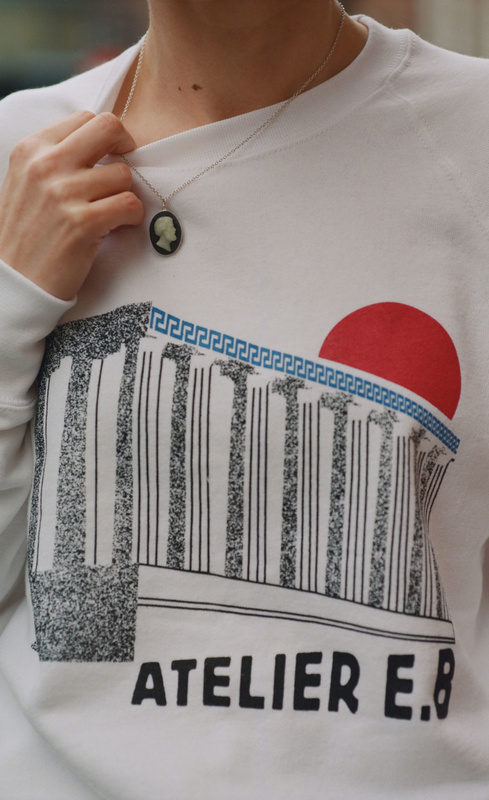 Ost End Girls collection 2013 Emma…blanket by Marc Camille Chaimowicz Photograph by Rob Smith. 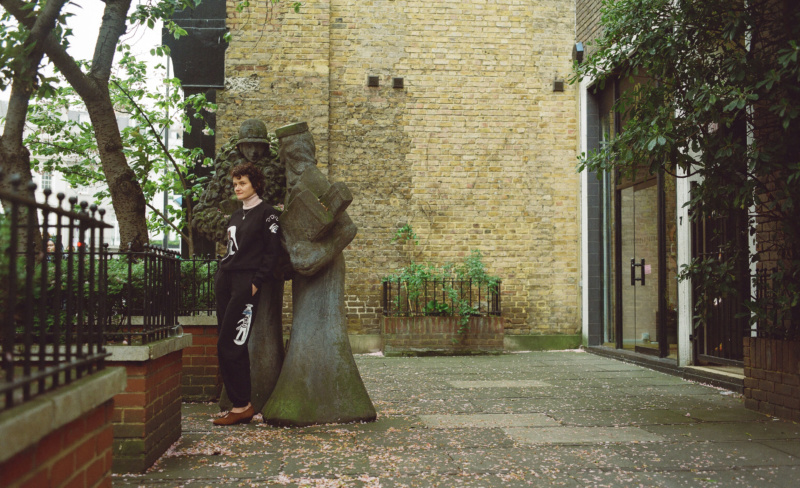 Photographers Zoe Ghertner and Josephine Pryde lead the way at the Serpentine. Lipscombe and McKenzie asked the artists to shoot their new collection—cashmere and nylon tracksuits, soft jackets and 3D-printed cameo necklaces—as they saw fit, and then bound the results into an accompanying publication which will be published after the exhibition. Of course, it wouldn’t be Atelier E.B if the designers didn’t invite the public to join in, which is why they designed Cleo’s, an app that allows users to upload and share their own fashion images without the pressure of likes or follower counts, and that encourages meeting in the real world. This digital extension of “Passer-by” underlines what separates Atelier E.B from other independent labels like Bless, Bernadette Corporation and Susan Cianciolo’s RUN, which in the late 1990s sought to use the vocabularies of art and fashion to subvert both. Atelier E.B’s goals aren’t simply about disruption, labor or displacement, but rather about establishing a sustainable network for cultural exchange. Atelier E.B’s ’33-’29-’36, UM Gallery – Academy of Arts, Architecture and Design, Prague, 2016. Photograph by Martin Polak. A photo by Zoë Ghertner, part of a photoshoot of Atelier E.B’s Jasperwear 18/19 collection. 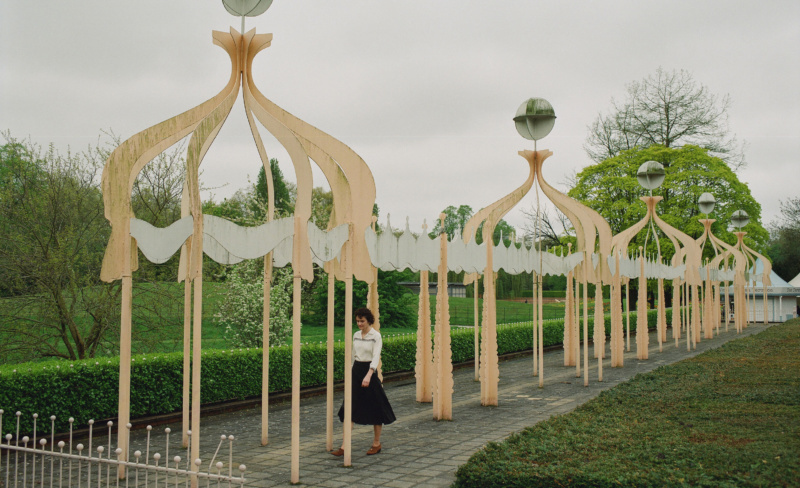 The whole series was staged at public sculptures and monuments that hold signicance for the duo, here the Legacy of ‘The Festival Pleasure Gardens’ from the Festival of Britain, 1951, Battersea Park, London with filmmaker Cara Connolly modeling the ‘Adrian shirt’ with “Vionnet” silk skirt (both available through their Serpentine show). Friendship forms the center of Atelier E.B, which is why perhaps the project resonates with me as a kind of sisterhood, one that seems to extend across centuries and binaries. 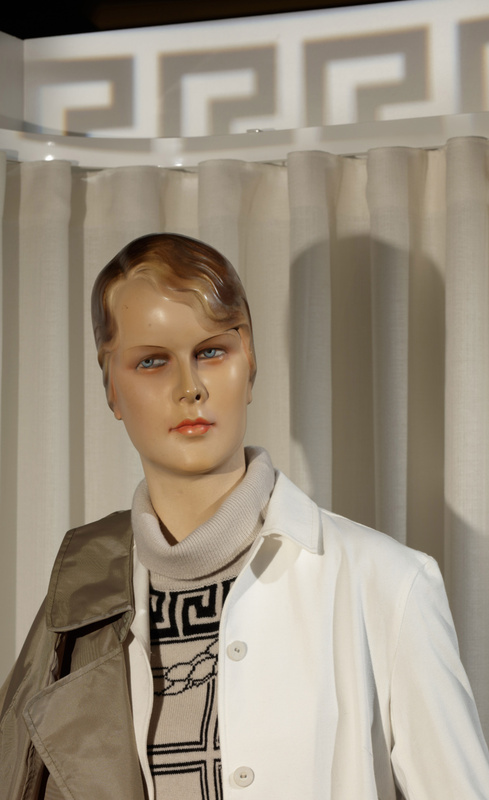 Walking home past the mannequin shops that line 25th Street, I see my neighbors like never before. They are praying, lunging and leaping in yogic postures—twisting themselves into unfamiliar shapes in the dark. We are all synchronized.